Bhutan’s beer culture is rapidly growing and Bhutanese are developing a taste for ingenious craft beers along with the already sought after strong beers. Many now prefer them over home brewed alcohols like Ara, Bangchang, and Singchang. Ara is made of grains like wheat and is distilled. The beverage is usually clear like water, unlike Bangchang and Singchang which are fermented and usually appear creamy or white in color. The commercialization of home-brewed alcohols is illegal in Bhutan. This is also one of the main reasons for people to switch to the now trending beer culture. Bhutan now has many beers to cater to the rising demands. 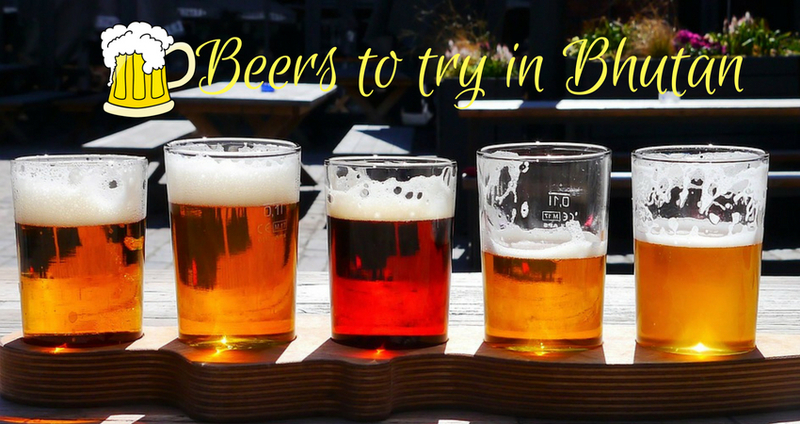 Here are 7 beers to try while traveling to Bhutan. 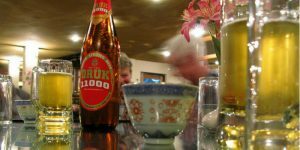 Brewed by one of the oldest breweries in Bhutan the Druk 11000 is the most popular among the locals. Mainly due to its strong taste and refreshing feel. The whopping 650ml bottle is perfect for a hot day and enough to get lightly tipsy with 8% alcohol content. The beer is made with natural Himalayan spring water which contributes to the crispness of the beer. Other lighter alternative to it is the Druk Lager with 5% alcohol content and the Druk Supreme. If you are traveling to Bhutan and strong beer is your thing; then Druk 11000 is the one you should not miss. The craft beer trend is fairly new to Bhutan but this beer is spreading like wildfire among both locals and foreigners. 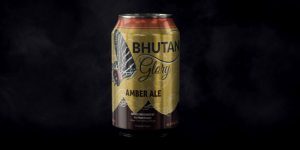 The Bhutan Glory-Amber Ale is produced by Ser Bhum Micro Brewery and is their main flagship beer. The beer is named after a species of butterfly found in Bhutan. This craft beer is very light with an alcohol content of 5%. The flavors are driven from the Munich and Victory malts giving the beer and malty caramel whiff. To give the beer a deep amber color, quite an amount of Crystal malt is used and for a bearable neutral bitter taste, Magnum hops are used. 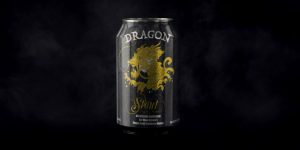 The Dragon Stout is a dark beer brewed with roasted barley and a liberal amount of chocolate malt are also supplemented to give the beer a deep dark color. The sharp taste is balanced by adding Crystal malt to give it a dash of slight sweetness. Bhutanese refer to their country as Druk in Dzongkha which translates to the land of Thunder Dragon which is why the beer is named after the symbol. If you are a coffee lover then this beer is certainly for you as the beer gives out a strong whiff of coffee. The Bhutanese-Red Rice Lager is a craft beer launched by the Namgay Artisanal Brewery in Paro. The brewery was established in 2015 and it has launched 3 craft beers since then. The most popular is the Red Rice Lager which is brewed using red rice produced in the Paro region and it is also the flagship beer of the brewery since Red rice and farming are an integral part of Bhutanese culture. The taste is quite nutty resembling the red rice itself which the Bhutanese palates could easily get used to. 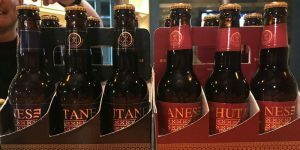 If you fancy craft beers then this beer has lots to offer and will most probably exceed your anticipation. The Dark Ale is also a product of the Namgay Artisanal Brewery and goes by the catchphrase “farmers’ beer” as the ingredients used are purely from the farms of the region. The main ingredient is the husk of the barley which is usually useless and is otherwise thrown away. Imported malts are then added to the beer. Enjoy these beers from tap at Namgay’s newly opened brewpub in Paro. Manufactured by one of the first microbreweries and the only one in Bumthang valley, the Red Panda Weiss beer is carefully brewed without adding preservatives and is bottled in its pure form without being filtered. The brewery is owned by a Swiss gentleman who also owns a cheese factory in Bumthang. The cheese factory produces Gouda cheese and Emmental cheese. Pair the two with the beer and you will have the best time on a hot day. 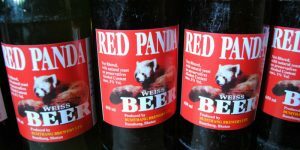 The beer is named after the endangered animal Red Panda bear in Bhutan. 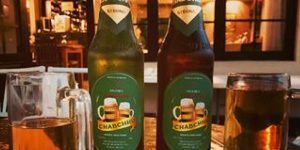 Chabchhu is a strong beer which has only been introduced to the market recently by Kinjore Brewery and is gaining a lot of popularity in a very short period. The beer is enjoyed by both locals and foreigners alike for its strong effect with an alcohol content of 8%. The brewery is set up at Pasakha in Phuentsholing district. It is available in a 650ml bottle and is enough to make you mellow with just one bottle. Other beers from Kinjore Brewery include Dragon Frost and Thunder 15000. Found the craft beers to be very expensive to the daily drinker. The last time I bought one, it was 120 for a 330ml bottle. I'll stick to Chabchhu and 11000.